Almost everyone understands that we need peace in the world, and we wonder why leaders do nothing to bring it about. While many US politicians are jerking the country around to give corporations and elites MORE power and money, President Obama is busy trying to save the U.S. and the world. If you don’t know about Rwanda, you might want to read up on it after reading this story. Horrific. Obama just averted another Rwanda and has more than earned his Nobel Peace Prize. A true leader surrounds themselves with the best advisors…and listens to them…and let’s them do their jobs. By rigging the Shutdown, Republicans need to be charged with SEDITION! Please sign this petition to AG Holder and share. Just before the shutdown happened, the GOP quietly passed a measure that said only House Majority Leader Eric Cantor can call for the shutdown to end (unless he gives a designee permission). Not even the most senior GOP congressperson, Speaker of the House John Boehner, is allowed to do it, without permission from his own guy. Republicans have lost at the ballot box and the Supreme Court, so they’ve decided to nullify President Obama another way: keep his government from working, period. Flying the Confederate Flag in front of the black President’s house is an abomination and direct threat to him and the will of the majority. They hate the President and blacks more than they love the country so much they are willing to destroy it. These are the same people who caused the shutdown and now blaming it on Obama who has a mandate from Americans with 5 million votes that won him the Presidency. They refuse to accept a black man as President and will stop at nothing to get their way. Are you registered to vote? Do you know who to vote for? Do you know when to vote? A new Quinnipiac University poll has President Obama at his highest approval numbers in three years, since he rid the world of its number one enemy, in fact. Fifty-three percent said they approve of the job the president is doing, compared with 40 percent who said they disapprove. In the previous survey conducted by Quinnipiac, in July, Obama’s approval rating was under water, at 45 percent positive and 49 negative. As for that pesky fiscal bluff/molehill/crossroads issue, the poll showed people trust the president and Democrats by a wide margin of 53% vs. 36% for the Republicans. A majority said they believe Obama and the Democrats will make a good-faith effort in the “fiscal cliff” negotiations, while a majority said they didn’t expect the same from Republicans. And there’s broad support for allowing the Bush tax cuts to expire for those making more than $250,000 a year, with voters siding with the president 65%-31%. There was also a sound repudiation of Grover Norquist’s anti-tax pledge. A whopping 85% thought it was a bad idea, including 77 percent of Republicans, and only 15% supported it. So after all these polls, when oh when will the GOP finally grasp what’s going on all around them? And when oh when will they truly realize they are imploding? 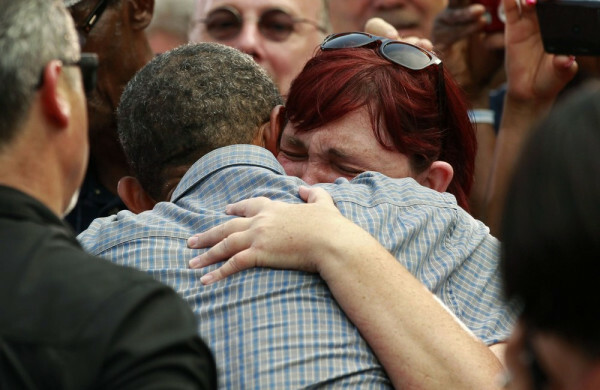 This Ohio voter was in tears thanking the president, who consoled her at a campaign stop in Sandusky, Ohio. Stephanie Miller’s sister died after battling colon cancer, partly because she couldn’t purchase insurance. Miller expressed her gratitude to President Obama for getting his Affordable Care Act passed. And wow, what a picture that is. While many have their head in the air (or up their arses), Obama is making things happen FOR THE PEOPLE. Not 4D, 5D or spaced out. Here on the ground help for the people in spite of tremendous opposition. That’s real talk, folks! More news at the link. The Republican budget plan, approved by the House last week last, cuts $5.3 trillion over the next ten years through deeps cuts in spending and entitlements benefits (because they are PAID FOR BY THE PEOPLE. The President has pretty much cinched the 2012 election. Listen to this speech and you will know why. Don’t miss this great speech.